Hola! In the mood for some Mexican food? 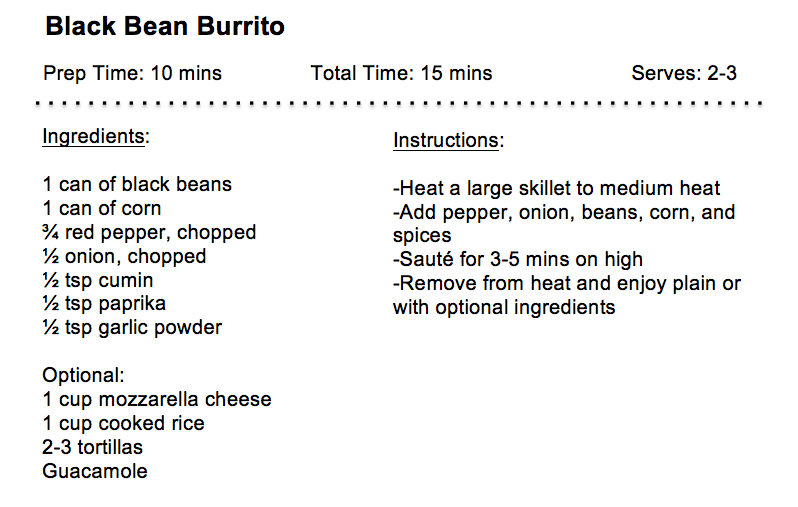 This black bean burrito recipe is delish! It is also one of the easiest recipes I have made; it takes less than 10 minutes and uses few dishes. Black Beans are a great source of protein and fiber to keep you full throughout the day. The approximate* nutrition facts for one serving are shown here. They include all ingredients excluding the optional ingredients listed on the recipe. My favorite way to enjoy this Mexican feast is using lettuce leaves as the burrito wrap and adding some guacamole (which is a great healthy fat). *Nutrition facts will vary depending on the brand and amount of ingredients used for this recipe.